DETTA PROGRAM LADDAS NER till din dator. Efter betalning får du direkt ett epostbrev med en Retrieval Code som ger dig tillgång till nedladdningslänk och registrering. Create your own CD/DVD labels, CD jewel cases, and print direct to CD with the ultimate in ease and flexibility! If you're sick of guessing which songs are on which CD, get the CD label software that automatically puts your track list on your CD/DVD label! Chock full of custom art for holidays and special occasions like Christmas, Valentines, birthdays, vacations, weddings and more! Automatically imports your track information from Acoustica MP3 CD Burner, iTunes, WinAmp, Easy CD Creator or any other popular playlist or previously burnt CD. 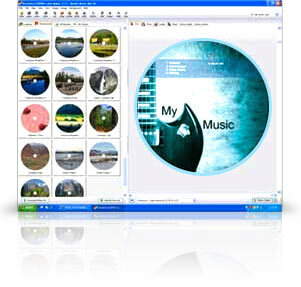 Print on standard paper, stock sticker labels, CD jewel case templates or print directly on a CD or DVD.